The Short Version: Relationship troubles often cut deep. It’s not just about the dishes, the clutter, or the offhand remark — it’s about the underlying insecurities that fuel conflict and hinder connection. Many couples struggle to deal with emotionally charged issues because no one taught them how to meet a partner’s deep-seated needs and de-escalate an argument. Armed with empathy and decades of knowledge, relationship therapist Rick Brown helps couples do the work to better understand and reassure one another, especially in times of conflict. His private coaching sessions and engaging workshops offer couples invaluable communication strategies that reinforce strong romantic bonds. For the past 35 years, Rick Brown has counseled hundreds of couples through rough patches and into stable and loving relationships. When psychotherapist Rick Brown and his wife, Celeste, traveled from Florida to New York to attend a workshop by Dr. Harville Hendrix, what they learned about communication and connection changed their lives. The experience made their relationship immeasurably better and stronger. 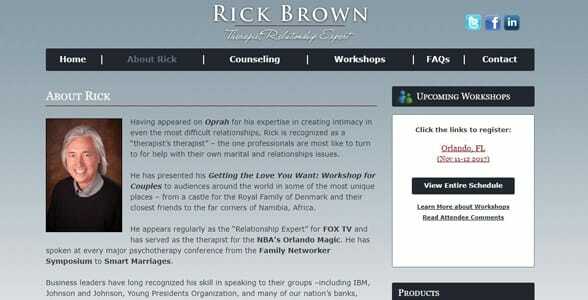 Relationship therapist Rick Brown has a private couples counseling practice in Orlando, Florida. Today, Rick and Celeste have been together for over 40 years, and Rick told us going to the weekend workshop was the best decision they ever made for their relationship. That trip not only strengthened his marriage — it gave Rick a new career path. Under the tutelage of Harville Hendrix (who pioneered Imago Relationship Therapy), Rick developed his expertise in healthy relationships and has trained hundreds of psychologists, psychiatrists, and other mental health professionals. 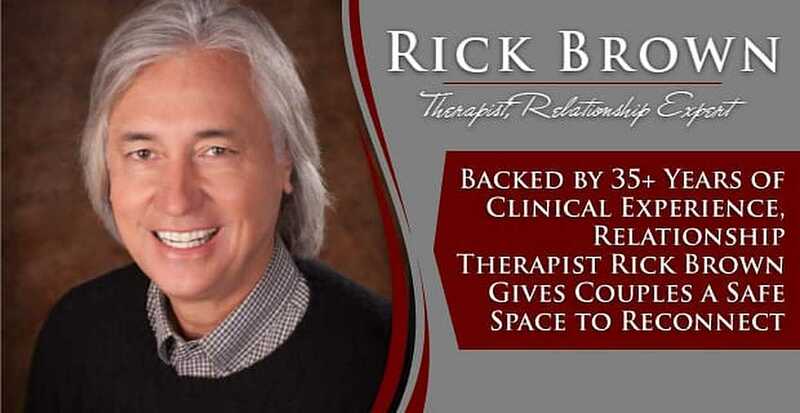 Over the years, many high-profile figures, including Oprah Winfrey and Orlando Magic coach Doc Rivers, have sought Rick’s expertise in marriage counseling and emotional connections. Now, backed by over 35 years of clinical experience, Rick works as a compassionate relationship therapist in Orlando and endeavors to promote the lessons and tools that made such a dramatic impact in his own life. Rick counsels couples in private sessions and hosts workshops attended by dozens of people seeking better personal relationships. He encourages dating and married couples to proactively address their issues and implement strategies to resolve conflict and put an end to negative relationship patterns. From his Winter Park office, Rick sees dozens of clients each week in 75-minute counseling sessions. His regular clients tend to come about once a week to work through the recurring frustrations and disappointments that keep them stuck in endless power struggles. Through in-depth and engaging conversations, Rick engages couples in a process that increases safety in how they communicate and increases their emphathic connection with one another. When couples begin to experience an empathic connection, their struggles tend to dissolve and/or they are able to move to a creative place and find a mutually satisfying resolution to their concern. In individual sessions, Rick Brown equips couples with the tools to create intimacy and end conflict. Some couples come to Rick from outside the Orlando area for intensive two-day therapy sessions. Through back-to-back sessions, the trained therapist imparts important communication tools to get the relationship back on track. In the Getting the Love You Want Workshop, Rick dives deep into the subjects of attraction and teaches 20+ couples how to fix their relationships. The workshop condenses months’ worth of couples therapy into two jam-packed days. From early morning to late evening, couples learn communication skills, cultivate compassion for one another, and discover what underlying issues impact the relationship. Rick uses lectures, written exercises, guided imagery, and live demonstrations (with volunteers only) to drive his points home. He wants to inspire people to break their destructive cycles and relate to their partners in more thoughtful and empathetic ways. It’s a journey of self-discovery, emotional healing, and spiritual evolution. Rick believes in the power of his teachings, having seen multiple couples transform after a few days of working with him. His low-pressure workshops make couples therapy more accessible and enjoyable. With energized language and informational resources, the professional therapist and counselor empowers people to carry his love lessons forward and build healthy marriages for themselves. His passion for sharing valuable relationship insights has taken him around the world to speak to audiences in places like Denmark and Namibia. He currently hosts Getting the Love You Want Workshops in Orlando, Florida, Charleston, South Carolina, and the Esalen Institute in Big Sur, California. You can register for Rick’s workshops online, by phone, or by mail. This educational and emotional weekend can have a tremendously positive impact on couples who want to repair their connection and renew their love. Rick has been working with couples for decades, and he’s gotten tons of positive feedback throughout his career. Sometimes his influence has been the difference between divorce and staying together for couples in times of crisis. “Thank you for lighting a light in our marriage to really be the best passionate friends for each other,” wrote Daniella Ortiz Baeza in a testimonial. This relationship expert teaches couples practical steps to deal with conflict, meet one another’s emotional needs, and foster a healthy partnership for years to come. Six weeks after the episode was taped, Oprah flew Rick across the country to meet the three couples for at-home follow-up sessions. The relationship therapist said he still hears from the couples who send updates about their lives and families. Their sessions with him gave them the knowledge to work on their relationships and build happiness instead of conflict. From the moment couples step into Rick Brown’s office, they benefit from a welcoming, nonjudgmental atmosphere. 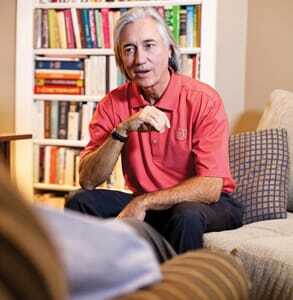 The relationship therapist approaches his clients with compassion and deep understanding. His personalized sessions and guided workshops provide a solid framework for repairing relationships in the long term. With supportive counseling, Rick gets to the root of the problem between two people and helps them to grow closer together. Decades ago, Rick began studying relationships when he and his wife made a conscious decision to cultivate compassion and intimacy in their marriage. Their journey took them to New York where he was introduced to Harville Hendrix and Imago Relationship Therapy, which showed them how to connect on deeper levels. Bolstered by the experience, Rick and Celeste not only improved the quality of their relationship but also fostered an emotionally stable environment for their three kids.